Beginning next fall, August 2019, students at Spoto High School can earn an associate’s degree while still in high school, potentially saving their families thousands in tuition fees and allowing students to get a head start on college. The program gives students an opportunity to earn an Associate of Arts degree (A.A.) through Hillsborough Community College while they earn their high school diploma. Students start taking classes in ninth grade so they are on track to receive their associate’s degree when they graduate. State colleges and universities in Florida accept the associate’s degree earned in high school, meaning, in effect, that Collegiate Academy students start in college as juniors, skipping two years of college. No small benefit for parents and families. “When I am out doing recruiting drives (for Collegiate Academy) parents will say ‘Are you kidding me? That saves a lot of money,’” said Camille Blair who is leading the program at Spoto. Blair will be spreading the word again Nov. 29 at Giunta Middle, a feeder school for Spoto. However, with choice options for families, students need not live in the Spoto catchment area to apply for the program. Students must apply to join the program and must have taken and passed Algebra I or Algebra I Honors. The deadline to apply is Dec. 31. “Obtaining their associate’s degree while they’re in high school just opens the door to so many opportunities, whether students want to continue on to that four-year degree or whether they’re going into the workforce already armed with that beginning credential,” Blair said. The program is currently offered at Lennard, Armwood and Leto high schools, leaving a hole in the Riverview area; no longer, Blair said. 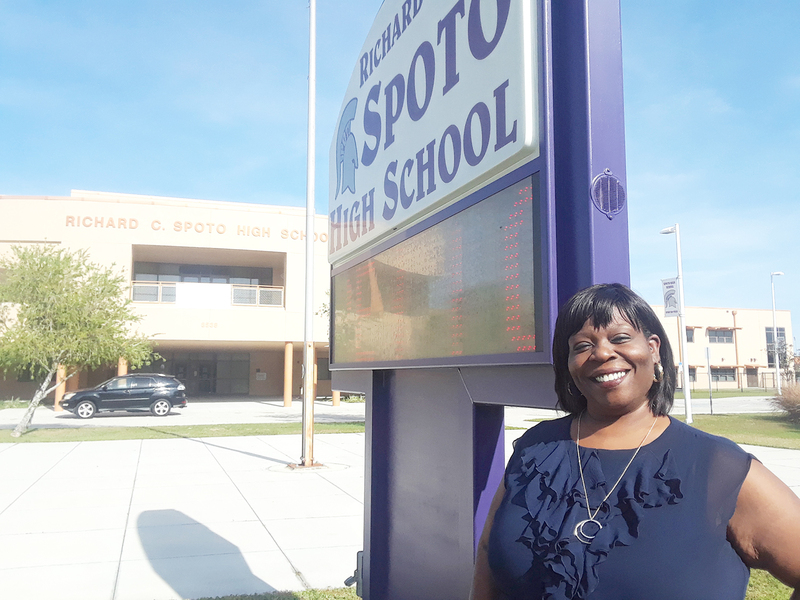 Collegiate Academy is a watershed moment for Spoto, said Rachel Roman, who has helped lead the rebirth of the school’s Parent Teacher Student Association. It’s the first time the school has had a PTSA group in a decade. • Take college courses, free of cost (including textbooks), during the school day on one of the Collegiate Academy High School campuses. • The academy will not only provide academic preparation but also other types of “college knowledge,” such as self-management of study routines and preparation for assessments. • The academy also helps students learn how to handle the pace and expectations of college courses and strategic use of resources such as college advisors and ambassadors from local college campuses. • Research shows that students who take dual enrollment classes — college and high school classes ­— are more likely to graduate from college, according to the county’s magnet website. While Collegiate Academy students will carry a rigorous course load — no beginning basket weaving here — they will also be encouraged to enjoy all that high school offers. For more information on Collegiate Academy or any other magnet program, visit the Hillsborough County School District website, www.sdhc.k12.fl.us/. You can also call Camille Blair at 813-672-5405 Ext. 260. Hillsborough County also offers magnet programs in Architectural and Environmental Design; STEM: Science, Technology, Engineering, and Mathematics; Academy of Health Professions; Academy of Veterinary Science; and Arts (Visual / Performing / Communication Arts).